There is a plant to suit just about everyone’s taste. Some people like to grow leafy, green houseplants. Other people like to grow spiny cactus or thick-leaved succulents. I like to grow flowering orchids. Orchids are always interesting. There are over 30,000 species of orchids worldwide. They can be found on every continent except Antarctica. 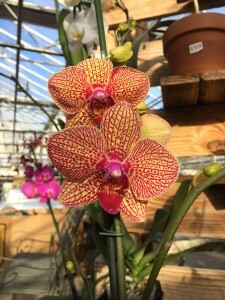 While many orchids are challenging to grow and must be cultivated under exacting greenhouse conditions that is certainly not true of all of them. I would like to tell you about one commonly available orchid that is pretty easy to grow in most homes. The Phalaenopsis Orchid, also known as the Moth orchid, is the most commonly found. Many people get one as a gift or purchase one on impulse. The arching sprays of flat faced flowers come in a wide variety of colors. It is not unusual to have the flowers last 2 to 3 months. The plant should be placed in bright, natural light for about 6-8 hours. An East to South facing window would be best. Place the plant on a gravel filled tray or saucer, about 1-1.5 feet from the glass. If the leaves feel hot to the touch on sunny days move the plant back so the leaves don’t burn. You can also grow them under fluorescent lights for 8 to 10 hours a day. Phalaenopsis in the wild grow on tree trunks. Their roots weave in and out of cracks in the bark. The plant usually grows at a 45 degree angle. This adaptation prevent s rainwater from collecting at the base of the leaves where it could promote root rot or disease. Moth Orchids are usually grown in sphagnum moss by most large growers. While this growing medium allows easy monitoring of root health and water needs, it is not the best for home growing. I prefer to grow my Phalaenopsis in a fir bark based mix. While orchids can be grown successfully in straight bark, I get better results using a mix that we sell which uses fir bark, charcoal, and perlite. Whether the Phalaenopsis are minis or full size plants I like to grow them in a pot that is wider then it is tall and I prefer plastic or ceramic pots. Terracotta pots are fine if you water a lot. Plastic or ceramic pots can be watered once to twice a week. 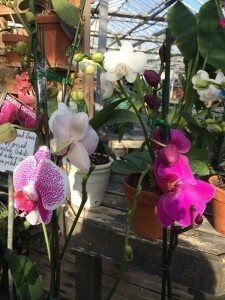 Moth orchids are most commonly found planted in a clear plastic pot which has been placed inside a decorative pot. They look very nice in these pots but their is one problem. The decorative pot doesn’t have a drainage h ole for excess water in the bottom. For the plants health you should slide the potted orchid out of this decorative pot for watering. I put the plant in my sink to water it. Water thoroughly until water runs out the holes in the bottom. After the plant has drained for about 10 minutes you can place it back in the decorative pot and enjoy these wonderful flowers. rticles on ladyslipper, oncidium, and cattleya orchids. 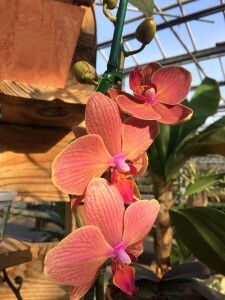 Also look for articles on orchid (and houseplants) pests and diseases and re-potting orchids. If you just can’t wait please call or stop by and we’ll do our best to help you be more successful orchid grower.